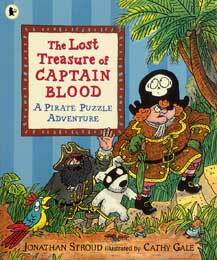 In The Lost Treasure of Captain Blood, the infamous pirates Mam and Sam Spamme, abetted by the marginally cleverer Black Dog, seek their fortune while avoiding the clutches of vicious pirate catchers Red Roger and Nelson the Cat. Involves sea battles, shipwrecks, traps, dungeons and ever-diminishing numbers of rats. 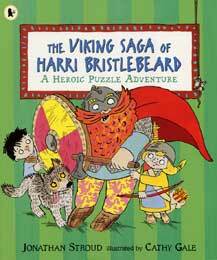 In The Viking Saga of Harri Bristlebeard, brave Harri must quest for the magical raven banner to restore fortune to his village, accompanied by Hilda, Wilfred and Fenrir the wolf. Involves sea serpents, trolls, wolves, dragons and ever-increasing numbers of lemmings. These two titles were written during the mid-1990s, when puzzle-books such as Where’s Wally/Waldo were hugely popular. Cathy and I tried to create books in which the puzzles were assimilated into proper stories, with strong characters and real narrative drive. We used comic strips to frame each central picture and keep the momentum going. Words and illustrations contain as many jokes as possible. Each book took many months, with every spread being redrawn several times by Cathy as we developed the plot and puzzles.